I've had a Qualcast Suffolk Punch 30s handed down to me from my dad after he has purchased a Atco Commedore B17. Unfortunately I am have vibrating issues with the Qualcast, however it does start perfectly first time. The machine also wont idle and the blades spin constantly. The machine also rev's itself up and down without touching the throttle. Please can anyone help with the first place to look regarding these issues? I have attached a picture of the machine below, sorry its not the best I will take some better ones later. Also does anyone have a instruction manual for this machine? Sounds as though you have two or three separate issues. The revving up and down, known as hunting, is usually (but not always) associated with fuel starvation / dirt in the carburettor.Looks as though your machine has a Delorto carb which is reasonably easy to clean but also easy to damage if the wrong tool is used to remove the main jet / emulsion tube. Continual drive. Possibly the centrifugal clutch shoes are seized on their pivots, the spigot bearing is dry or just the result of the engine running too fast. Vibration . Could just be a characteristic of the engine . As the centrifugal clutch needs to be investigated you could unbolt the engine and remove the clutch back plate and shoes from the engine crank , then bolt the engine back onto the chassis and run it disconnected . If the vibration is the same there's not a lot you can do unless you find that someone has broken a lot of fins off the flywheel. If running without the clutch removes or reduces the vibration, you need to examine the clutch and drive line for out of balance components or misalignment. Early machines had machined steel clutch drums which usually ran true, but later ones had pressed steel and welded drums which were often misaligned right from manufacture. Also the original machined steel back plates were replaced with cast alloy ones, some of which were not a good fit on the crank. DO NOT RUN A LOOSE ENGINE WITH THE CLUTCH BACK PLATE IN PLACE UNLESS THE SHOES ARE REMOVED. Your machine will have originally had a handle bar console incorporating a plastic fuel tank. These were prone to leaking and were replaced with a shell console over a steel tank. In you case it appears that a console and tank assebly has been dispensed with and replaced by a "foreign" tank. In addition to wristpins advice have a close look at the engine mounting plate and check for cracks running out from the corners of the square holes containing the caged nuts. 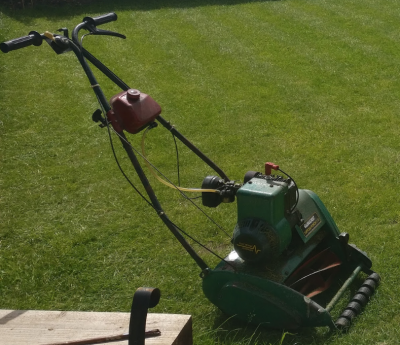 If cracks are found they will need to be welded before refitting the engine to the mower, I have seen cracks on several of these mowers and repairing them almost always improves the stability of the engine. Thanks you both for your advice. I have adjusted the idle, cleaned the carb and replaced the oil as per the manual and the mower seems much better. The blades no longer spin when idling. I've attached a video below to see what you think. Quite good for an A98!! My knowledge of Suffolk/Qualcasts is a bit sketchy, but didn't the A98 fitted to the 30s have a Zenith carb? I thought only the 35s fitted with the A114 got a DelOrto. That almost triangular tank was fitted for years, only the last ones got the strange clumsy looking plastic cowl on the handlebars, but the green starter and fan cowl is fairly late. My guess, it was made circa 1993. The first A98s had the Zenith, air vane governor and points ignition. The later ones went Delorto, Mechanical governor and electronic ignition . The first manifestation of the plastic " console" incorporated the fuel tank and nearly all developed leaks. They then reverted to the steel tank but covered it with a dummy console. The one illustrated would appear to have the Delorto and electronic symbol on the recoil unit and I may be able to dig out the service bulletin announcing the change so we may be able to say that the machine illustrated must be post that date. Will have a look later. Edit. not sure whether this helps or confuses?! I could be wrong, but didn't the first A98 engines have the Zenith carb and points ignition and were, for all intents and purposes, a 98G14 with an alloy block. The next changes were the Zenith carb moved to a fixed main jet and electronic ignition. Then the A114 engine was released, very similar to the last A98 but fitted with the Delorto carb and mechanical governor, these engines were painted gold instead of the black that the A98's were painted. Later engines were basically variations on a theme, with the block colour returning to black. Does anybody know why they moved to an alloy engine ? Shows how much I know, I went to a machinery auction today and there was a 35s with a Zenith carb, (red fan cowl too) so it wasn't the mower size that determined if it got an A98 or a A114. What as the A148 fitted to? SIF stands for Suffolk Iron Foundry. Qualcast were a big supplier of cast aluminium parts to the car industry. Could it be that the merged Suffolk/Qualcast company wanted to close the iron foundry? Incidentally I recently bought a pack of SIF welding rods, so that side of the old company still survives. As you say, Midland, or was it Birmingham Quality Castings? made all sorts of things - including ironing boards! Lots of history on the net ending with the Bosch ownership before the Qualcast name was sold to the Home Retail Group aka Argos and is used on Chinese built mowers. The Atco name went to Global Garden Products and is appearing on Stiga rider etc and I've lost track of where Suffolk has ended up! Thought I was right about SIF welding rods, so checked them on the SIFbronze website. "Louis Tibbenham decided to retire in 1955, handing over to his son, Frank. In 1958 the company became apart of the Qualcast Group and then, in 1967 Qualcast merged with Birmid Industries. Louis' grandson, Paddy, is now the Director responsible for Sifbronze." OK, no body seems to know why they moved to alloy engnes, it is quite easy really, the cast iron plant failed a health and safety inspection and they didn't want tp pay the vast amount of money required to bring it up to date.